This time of year always reminds me of the summer's-end vacations. Those vacations squeezed between summer vacation and school, or between summer and fall. Long ago it was when the brothers and I would typically take our Boundary Waters Canoe Area trip every year. We would usually drive up Labor Day and spend most of the week in the BW. We loved that time of year because it wasn't too hot, and the bugs were almost a non-factor. The nights got a little cool, but nothing unbearable and the days were usually in the low 70's and not too humid. The fishing was slightly better than in the heat of summer, but really you needed to wait a week or two later to get the good action, at least I'm told that. The other vacation that we took this time of year was usually a trip to the cabin in Mercer, WI which I never knew until just now, is the Loon Capital of the world, whatever that means. I mean who's to say it's the Loon Capital other than the Mercer Chamber of Commerce? Maybe there's more loons in Hayward WI, or Ely MN, or Duluth. I guess you've got to be known for something. 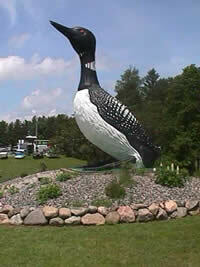 They do have a 2000 lb, sixteen foot giant loon in town, so I guess that qualifies for something. Anyways, my family from Minnesota would typically rent out 3 or 4 cabins and all meet up there for a week of fishing, swimming, golfing and just hanging out. It was a great way to get the adult siblings and all the cousins together for a whole week when the kids were small. Before Mercer it was a place in Hackensack, MN, home of Lucette, Paul Bunyan's sweetheart evidently. She is over 12 feet tall as well and probably weighs as much as the loon. I read where her head fell off during a storm some years back and while they fixed her, they said she wasn't around because she was "with child." There is a smaller statue of Paul Bunyan's child next to her. So welcome to Americana, I guess. It seems there's many towns that claim to be Paul Bunyan's birthplace, including Bemidji MN, Eau Claire WI, and even Bangor ME. Perhaps we'll never know the truth. Before Hackensack, we would go to Morningside Resort in Aitkin, MN, which as near as I can tell is only famous for the Turkey processing factory in downtown. It was always traumatizing to go to the Aitkin County Fair and have to walk past the plant and see all the turkeys flopping around upside down on their way to a thanksgiving demise. All three of these places hold great memories. We'll be heading back up to Mercer this weekend with some friends. We're looking forward to re-connecting with the proprietors of Pine Forest Lodge, John and Cheri Stratte, old friends from way back. I hope to land a musky or two and a few walleyes with the kids too. Look for a picture by the sixteen foot giant loon, soon enough.